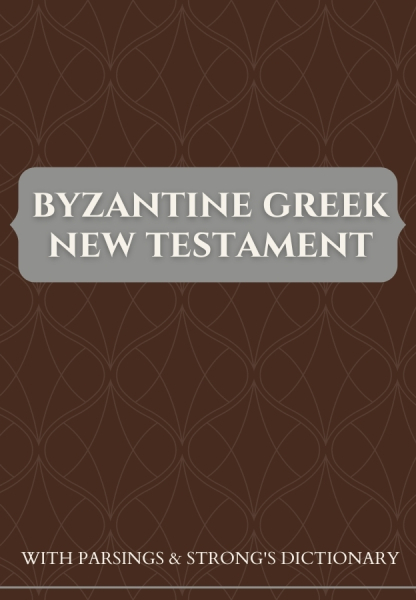 The Byzantine Greek New Testament with Parsings presents the Greek New Testament following the Byzantine textual tradition and based on the work of Maurice Robinson. It also contains parsing data and Strong's tagging based on the work of Dr. Robinson. This allows users to tap on a word and view both the parsing and the corresponding Strong's number. This bundle also contains the Olive Tree Enhanced Strong's Dictionary, which can be accessed via the popup window from the main Greek text. The Byzantine text-type is the most widely attested textual recension among ancient manuscripts. However, it is not as widely relied on by modern critical editions such as the UBS4 or NA28 since many of the oldest manuscripts follow the Alexandrian textual tradition instead. Nevertheless, the Byzantine text is still of great interest to both students and scholars, as it presents a widely-used traditional text of the Greek New Testament. It is the basis of the Textus Receptus, which, in turn, is the basis of the King James Version, the Luther Bible, the Dutch Statenvertaling, and virtually all other translations up until the 20th century.